Post-traumatic arthritis is a common cause of arthritis leading to the total knee arthroplasty procedure. If the original injury was a fracture, often residual hardware remains that necessitates a change in the usual surgical technique. If there is a femoral rod or hardware extending into the femoral canal, then standard intramedullary instruments are not possible, and a different approach is needed. This may involve complete removal of the hardware or partial removal to allow the use of standard instruments. “Smart instruments” are now available and include handheld computer and gyroscope-like devices that allow for hardware to remain in place or custom cutting jigs that are patient-specific and allow for the hardware to remain in place. Consideration on the tibia side is a bit different since it is quite common to use an extramedullary device for the tibial osteotomy. 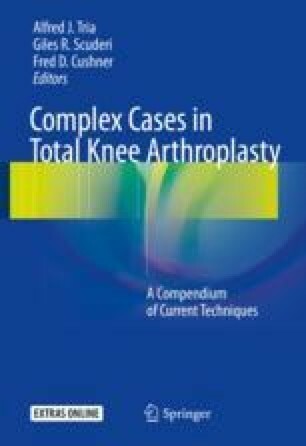 Complete or partial hardware removal may be required for prosthesis placement, and often a change in tibia design can allow prosthesis placement without the need for any hardware removal. The goal here is the less removal the better, and numerous options exist to make this task easier. Koenig JH, Maheshwari AV, Ranawat AS, Ranawat CS. Extra-articular deformity is always correctable intra-articularly: in the affirmative. Orthopedics. 2009;32(9). https://doi.org/10.3928/01477447-20090728-22.